Everything you see on this web site, including, but not limited to text, images, graphics, icons, audio clips, animated thingies, program codes and other "software", was painstakingly created by someone who worked really hard to make us happy, and is therefore the property of Tonewheel General Hospital, or, was provided by one of our suppliers and is therefore their property. This stuff is protected by United States and international copyright laws. With the exception of the Hammond/Leslie Age List, no portion of this web site may be reproduced in any form. 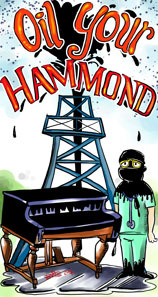 With respect to the Hammond/Leslie Age List, free reproduction rights are granted for non-commercial use provided proper attribution is made indicating the content was obtained from Tonewheel General Hospital. We want our 15 minutes of fame! All product names and company logos mentioned or included on this web site remain the trademarks or registered trademarks of their respective holders. This means words like "Hammond", "Leslie", and "Trek II". Tonewheel General Hospital has no trademarks or patents, but if we did they would be listed and acknowledged here. We looked into getting a trademark, but it was too hard to figure out and we would have had to hire a special lawyer just for that one thing, so it wasn't worth it. Anyway, who's going to steal "experienced"? Tonewheel General Hospital grants users of Tonewheelgeneral.com a limited license to view, but not to copy (other than the web page caching that various web browsers perform), any of the publicly accessible content on this web site. Any method of monitoring or collecting information on Tonewheelgeneral.com for use by any merchant offering the same products as Tonewheelgeneral.com, or products competitive or comparable to the products offered by Tonewheelgeneral.com, is expressly prohibited. This license does not include or allow the resale or commercial use of Tonewheelgeneral.com or its content; any collection and use of any product listings, descriptions, or prices; any derivative use of this site or its contents; any downloading or copying of account information for the benefit of another merchant; or any use of data mining, robots (droids), or similar data gathering and extraction tools. You are granted a limited, revocable, and nonexclusive right to create a hyperlink to the home page of Tonewheelgeneral.com so long as the link does not portray Tonewheelgeneral.com in a false, misleading, derogatory, or otherwise offensive matter. Be nice! Upon any prohibited or unauthorized use of Tonewheelgeneral.com, your license to use Tonewheelgeneral.com is immediately revoked and you must begin listening to accordions and bagpipes playing Joan Jett & the Blackhearts' "I Love Rock and Roll". Furthermore, Tonewheel General Hospital reserves the right to revoke this license for any behavior deemed by Tonewheel General Hospital to be destructive, disruptive, or otherwise evil, even if said behavior is not explicitly listed in this license agreement. We are really sorry about all that stuff. That's lawyer-speak for protecting the massive investment of money and time to develop this web site. Anyone who is reading this doesn't have to worry about it - dishonest people don't read EULA's. Tonewheel General Hospital endeavors mightily to make shopping for your Hammond or Leslie needs easy. We like to keep things as simple as possible, but must reserve the right to change our policies, prices, and product availability without notice. Our suppliers have this in their agreements, so we figured we had better have it in ours. We don't know what they have in mind, but we suspect they won't tell us until after the fact. Whenever possible Tonewheel General Hospital will honor previously made commitments because that is an honorable thing to do; just don't hold us to it. A restocking fee will be imposed on returned items; please write or call for an RMA number prior to returning anything. Product descriptions and images are as accurate as possible, but we aren't marketing geniuses or photographic arts majors. We try very hard to provide accurate text and pictures, and although we do know a lot about Hammonds and Leslies, we can't guarantee the accuracy of any of the information or images contained within Tonewheelgeneral.com, and such information and images are not intended for any use where an inaccuracy might cause loss, damage, or danger to any person, group, company, organization, country or eco-system. Please forward comments regarding accuracy issues to info@tonewheelgeneral.com. More lawyer double-speak. Really fills you with confidence about us, eh? They said that section is for folks who attempt to qualify as candidates for the Darwin awards. Tonewheel General Hospital will not be liable for any damages or loss of profits, business, resources, or interests, whether consequential, special, indirect, or punitive, even if advised of the possibility of such damages. Tonewheel General Hospital will not under any circumstances be liable or responsible for any amount of damages greater than the aggregate U.S. dollar amount paid by the customer for purchase(s) made under this agreement (excluding applicable sales tax and shipping charges). Tonewheel General Hospital is not and will not be liable for content on any web site linked to or from the domain of this web site. Any dispute relating in any way to your visit to Tonewheelgeneral.com or to products you purchase through Tonewheelgeneral.com shall be submitted to confidential arbitration in Kansas City, Missouri, except that, to the extent you have in any manner violated or threatened to violate Tonewheelgeneral.com's intellectual property rights, Tonewheel General Hospital may seek injunctive or other appropriate relief in any state or federal court in the state of Missouri, and you consent to exclusive jurisdiction and venue in such courts. Arbitration under this agreement shall be conducted under the rules then prevailing of the American Arbitration Association. The arbitrator's award shall be binding and may be entered as a judgment in any court of competent jurisdiction. To the fullest extent permitted by applicable law, no arbitration under this Agreement shall be joined to an arbitration involving any other party subject to this Agreement, whether through class arbitration proceedings or otherwise.